ELEANOR ROOSEVELT. 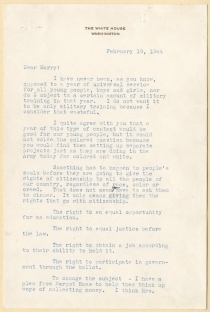 Typed Letter Signed, to “Harry,” Washington, D.C., February 19, 1944. 2 pp., 6¼ x 9¼ in. On White House stationery. I have never been, as you know, opposed to a year of universal service for all young people, boys and girls, nor do I object to a certain amount of military training in that year. I do not want it to be only military training because I consider that wasteful. I quite agree with you that a year of this type of contact would be good for your young people, but it would not solve the colored question because you would find them setting up separate projects just as they are doing in the Army today for colored and white. Something has to happen to people’s souls before they are going to give the rights of citizenship to all the people of our country, regardless of color or creed. That does not mean you have to ask them to dinner. It only means giving them the rights that go with citizenship. The right to an equal opportunity for an education. The right to equal justice before the law. The right to obtain a job according to their ability to hold it. The right to participate in the government through the ballot. To change the subject—I have a plea from Margot Haas to help them think up ways of collecting money. 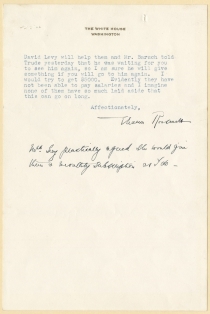 I think Mrs. David Levy will help them and Mr. Baruch told Trude yesterday that he was waiting for you to see him again, so I am sure he will give something if you will go to see him again. I would try to get $5000. Evidently they have not been able to pay salaries and I imagine none of them have so much laid aside that this can go on long. [handwritten]: Mrs. Levy practically agreed she would give them a monthly subscription as I do. Eleanor Roosevelt was a staunch advocate for equal rights, whether women’s rights, international human rights, or civil rights for African Americans. She began her social activism in the early twentieth century by working at the College Settlement in Manhattan’s Lower East Side. There, Roosevelt taught physical education to the children of immigrants. It exposed her, and her future husband, to the plight of impoverished industrial workers, and helped open FDR to the possibilities of helping alleviate poverty and social problems. After FDR became President, Eleanor toured the nation, witnessing the effects of the Great Depression on rural areas, especially in African American communities. She then pressured the Subsistence Homestead Administration to allow African Americans into Arthurdale, a planned community designed to create economic self-sufficiency. Her efforts failed, but it highlighted the depths of institutional racism in the United States. Roosevelt lobbied for civil rights inside her husband’s administration and to the general public via radio and print media. She fought against lynching and segregation, even resigning her membership in the Daughters of the American Revolution when they barred black opera singer Marian Andersen from performing in Constitution Hall. Instead, Roosevelt arranged for Andersen to sing on the steps of the Lincoln Memorial and urged media outlets to promote the concert on television and radio. Despite her efforts, segregation was the norm in many early New Deal programs, as well as the armed services during the war. Here, Roosevelt feared the same thing occurring in a proposed postwar national service initiative. “As World War II was coming to an end, the House...established the Select Committee on Post-War Military Policy,” according the National Archives and Records Administration....“The select committee was directed to study postwar military requirements.” In typical fashion, Roosevelt recommended that the universal service include more than just military training. Adele Rosenwald Levy (1892-1960) was the daughter of wealthy Chicago businessman and philanthropist Julius Rosenwald. She married David Levy, her second husband, in 1927. When the couple moved to New York City, she began her own philanthropic work. Over the course of her life, she served for many charitable and artistic foundations: the Citizens Committee on Children of New York City, Play Schools Association, Stadium Concerts, Inc. and she sat on the board of trustees of Brandeis University and on the executive committees of the Museum of Modern Art, New York State Youth Commission, New York City Youth Board, and the Wiltwyck School for Boys, where she also served as first vice president. Levy collected many awards for her service. During World War II, Levy became the first chair of the National Women’s Division of the United Jewish Appeal and served as vice chair of the Committee of Displaced Persons. In the immediate aftermath of the war, Levy was an instrumental fundraiser in helping settle Holocaust survivors. Margot Haas was a civil rights activist who was apparently in search of funding. 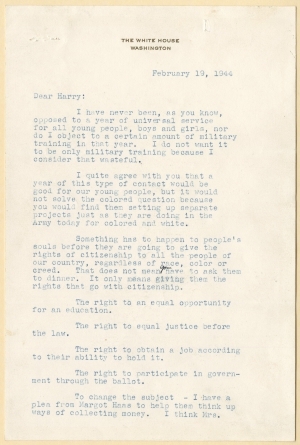 In 1951, Haas published a book entitled How to Conduct a Community Self-Survey of Civil Rights, which was the culmination of an American Jewish Congress project that began in 1944. Considering the other names mentioned, including financier and statesman [Bernard] Baruch and Levy, it is likely that the “subscription” mentioned went towards supporting UJA or another similar Jewish philanthropic organization.